↑ Socrates of Constantinople, Church History, book 1, chapter 33. Anthony F. Beavers, Chronology of the Arian Controversy. 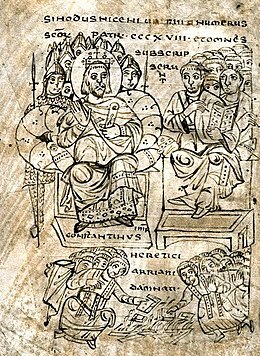 ↑ "First Council of Constantinople, Canon 1". ccel.org. หน้านี้แก้ไขล่าสุดเมื่อวันที่ 10 มีนาคม 2556 เวลา 00:16 น.